Fertilizers and fertilizer enhancers, also called soil amendments or conditioners, are added to the soil to boost plant health and growth. These products can be organic or inorganic, and some formulas even do the job of a fertilizer and an enhancer. Fertilizers are used to improve the nutrients while enhancers are used to breakdown hard soil to make it easier for the plants to use the nutrients in the fertilizer. The two products often work hand in hand to produce beautiful and vibrant plants. If you feed your plants with the appropriate fertilizer on the correct schedule and still notice that your plants are not thriving, you may want to consider using a fertilizer enhancer. Plants may seem to lack fertilizer, but what actually happens is that the fertilizer you provide is not getting to the plants. Hard-packed soil and clay also make it difficult for plants to access the nutrients. A good enhancer product can help break up the soil and free up nutrients for the plants. When soil conditions aren't right, most of the chemicals in the fertilizer become insoluble, inorganic salts. Over time, the soil quality greatly diminishes as inorganic salts accumulate. Chemical salts reduce the number of healthy soil organisms that are needed to convert organic and inorganic matter into a form that plants can use to grow and bear fruit. Chemical pesticides and herbicides can also harm beneficial soil microbes. The right enhancer can help restore soil health and encourage microbial growth. The key to bountiful crops and healthy plants is to use a soil enhancing product alongside the fertilizer. This will unlock the plant food and allow plants to absorb it and reach optimum growth and condition. Here are a few fertilizer enhancer products that you can use in your landscape to encourage healthy growth of all of your plants. 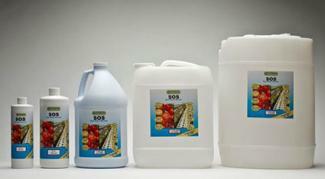 SOS contains microbes that tackle inorganic salts and turn them into substances that can be used by the plants. It's suitable for any plant, flower, vegetable or grain crop, and grass. The breakdown process releases fatty acids and humates that also help encourage healthy plant growth and vitality. Microbes in SOS breakdown toxins from pesticides and herbicides as well as other damaging substances contained in irrigation water. The end result of this breakdown is harmless carbon dioxide. The product also hastens the breakdown of dead organic materials and converts them into forms of nitrogen and phosphorus that plants need. The manufacturer of this product also states that using it will help maximize water usage. SOS is sold by Strata International. A 16-ounce bottle sells for about $23. A one-quart bottle sells for around $33. The product is also available in larger amounts for bigger crops. Most home gardeners can get by with the 16 or 32-ounce bottle since the product must be diluted with water before applying. 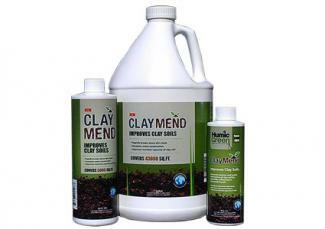 ClayMend is an all-natural product that breaks down the bonds that keep hard clay and other soil together. It also encourages biological activity that further loosens the soil. This product helps restricted roots grow freely and enables them to absorb nutrients that have been locked in clay, including those provided by fertilization. Aeration and water flow are also greatly improved, and the product repairs soil that has been damaged by high-salt-content irrigation water. Once the nutrients are released, vegetables, lawns and flowers can readily use them for growth and fruiting. Compared to other natural substances such as gypsum, which works only temporarily, ClayMend tends to produce sustained results with continual use. Depending on how hard-packed your soil is, it may take some time, but it will eventually break up. Overall customer satisfaction is high as noted on the product site. Customers note that both grass and plants were remarkably healthier after use. ClayMend is sold by Humic Green. An 8-ounce container covers about 2,500-square feet and sells for around $20. A 16-ounce container covers approximately 5,000-square feet and sells for about $37. A 1-gallon container covers around 43,000-square feet and sells for just under $200. Liquid "Gypsum" is a liquid-based gypsum product, and it's very easy to apply. The product comes ready to use, so no mixing is required. Gypsum works from the surface to loosen and soften hard soil without digging or tilling. The product improves soil drainage and helps fertilizers and water absorb into the soil. With softer soil and better drainage, roots can spread out, lawns become greener, and both crop and landscape plants become healthier. 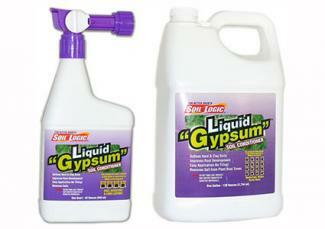 Liquid "Gypsum" is sold by Soil Logic. A 32-ounce bottle treats 1,000-square feet and sells for about $15.00. A combo pack with a 32-ounce bottle and a 1-gallon refill treats about 5,000-square feet of soil and retails for about $40.00. If you prefer a product that includes fertilizer as well as enhancers, try Down to Earth Greensand. This soil conditioner and fertilizer has a long standing reputation for helping gardeners improve the health of their plants. Greensand contains iron potash silicates and other ingredients that are marine based. It breaks up clay soils and improves the ability of clay and sand to hold water. 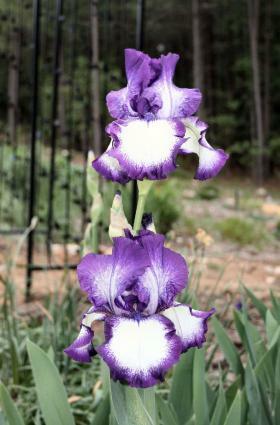 It is especially helpful in container plantings and reduces the need to water pots constantly during the heat of summer. Down to Earth Greensand can be purchased on Amazon.com, and 25-pound bag sells for just over $30. The best way to encourage healthy plants is to feed your soil. Provide a good supply of composted material and organic matter. This will help improve the soil structure, increase the biodiversity and number of beneficial microorganisms, and slowly release nutrients for the plants. If your plants are still struggling after that, consider adding fertilizer and possibly an enhancer as needed.